New Items @ Kyoot & KOOKIE! Two uber cute items first one from Kyoot and the second from Kookie. Both are must haves for the fall! Both can be paired together and make a yummy outfit. 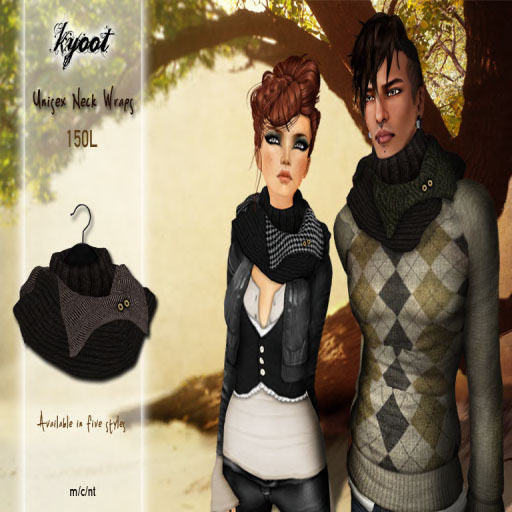 The first item is the unisex neck wrap from Kyoot, so you SL men out there here’s your chance to snag this stylish item for yourself. The 2nd item is the Vo Pumps from Kookie which come in a variety of colors and can be paired with jeans or leggings and a cute top or jacket! Surely is, sorry for the oversight and it has been corrected.